The Durban summit will go down in history as a defining moment in the trajectory of the South-South cooperation and marked the maturation of the BRICS grouping. In the balmy coastal city of Durban which birthed the Gandhi revolution over a hundred years ago, the seeds of a new rejuvenated South-South movement have been sown, with the BRICS leaders launching a path-breaking Development Bank that seeks to uplift over three billion people in the developing and emerging world. The two-day summit culminated with a unanimous decision by the leaders of Brazil, Russia, India, China and South Africa to set up a BRICS-led Development Bank that will finance development and infrastructure development not just in emerging economies, but also in the larger global South. In another important step to cement the intra-BRICS economic architecture, the leaders of the world’s five emerging economies, which account for over a quarter of global GDP, also endorsed a $100-billion contingency reserve arrangement that will be deployed as a last resort in case of a serious crisis afflicting a BRICS country. “We have decided to enter formal negotiations to establish a BRICS-led new development Bank based on our own considerable infrastructure needs, which amounts to around $4.5 trillion over the next five years, but also to cooperate with other emerging markets and developing countries in future,” said South African President Jacob Zuma, the host of the 5th BRICS summit. “Our resolve extends further to also establish a BRICS Contingent Reserve Arrangement. We are working towards related initiatives in our economic deliberations to further strengthen our intra-BRICS cooperation,” he said. The 5th BRICS summit has proved to be the most substantive one, with important headline-hogging outcomes that have the potential to create a new dialectics of development and geopolitics in the mutating international order. Besides the bank and the contingency reserve arrangement, the summit also saw important steps in deepening the framework of intra-BRICS cooperation. These pivotal steps included the setting up of a 25-member BRICS Business Council and the BRICS Think Tanks Council that seeks to create new pathways of South-South economic cooperation. For India, which took the lead in shaping the Development Bank, the fruition of the key ideas that flowed from the 2012 New Delhi summit was a moment of special pride and resonance. “It gives me great satisfaction to note that one of the ideas that we first discussed at New Delhi, that of instituting a mechanism to recycle surplus savings into infrastructure investments in developing countries, has been given a concrete shape during the Durban Summit,” said Indian Prime Minister Manmohan Singh. “Our Finance Ministers will now work to develop the details of this project,” he said. Talking to Indian journalists, India’s Finance Minister P. Chidambaram explained key features of the Development Bank. “We (the finance ministers of the five countries) gave a big idea and that idea has now become a reality -- that is the BRICS development bank,” Indian Finance Minister P. Chidambaram told journalists here, soon after the conclusion of the plenary session on the second day of the two-day summit. He added that the finance ministers and officials of the two countries have been given a 12-month time-frame to work out modalities like the capital of the proposed bank, its domicile and the governance structure. “We should have a nearly complete document when the leaders meet again in Brazil next March,” he added. Delineating contours of the contingency reserve arrangement, Chidambaram said the bulk of the money, that is $41 billion, will be pledged by China, $18 billion each will come from India, Brazil and Russia, while South Africa has agreed to $5 billion. Russian President Vladimir Putin welcomed the decision to launch the Development Bank and made a robust pitch for accelerating multi-polarity in international relations. The Durban summit ended on a high note, with all the leaders of the emerging economies reaffirming their political will to take intra-BRICS cooperation to new heights and to transform the grouping into a powerful platform for a counter-narrative on key international issues. This was reflected in the BRICS strong position on Syria and the warning to the West against military adventurism in Iran. “We express our deep concern with the deterioration of the security and humanitarian situation in Syria and condemn the increasing violations of human rights and of international humanitarian law as a result of continued violence,” said the eThekwini Declaration that was issued at the end of the first BRICS summit held on the African soil. Against the backdrop of the West-driven agenda of regime change in Syria, the BRICS leaders positioned the grouping as the voice of moderation and consensus-building. “A Syrian-led political process leading to a transition can be achieved only through broad national dialogue that meets the legitimate aspirations of all sections of Syrian society and respect for Syrian independence, territorial integrity and sovereignty as expressed by the Geneva Joint Communiqué and appropriate UNSC resolutions,” said the declaration. “We support the efforts of the UN-League of Arab States Joint Special Representative,” said the declaration. In a clear warning to the West, leaders from emerging powers also voiced their opposition to threat of military action against Tehran, amid ominous noises emanating from the US and Israel that they will not tolerate a nuclear-armed Iran. “We are concerned about threats of military action as well as unilateral sanctions,” the BRICS leaders said at the end of a two-day summit. “We are concerned about threats of military action as well as unilateral sanctions. We note the recent talks held in Almaty and hope that all outstanding issues relating to Iran’s nuclear programme will be resolved through discussions and diplomatic means,” said the declaration. The sharp stand taken by BRICS on the situation in Syria and the Iranian nuclear programme underlines the transformation of a grouping that started off as a forum focused on mitigating the global financial slowdown, but has emerged as a powerful pressure group in international politics that advocates multi-polarity in international relations and multilateralism in resolving global peace and security issues. The Durban summit will go down in history as a defining moment in the trajectory of the South-South cooperation and marked the maturation of a grouping that started off as a forum focused on global economic governance issues, but has widened its horizon to include an ambitious all-encompassing global agenda to rekindle development in the emerging world and reclaim the weight of the global South in the international arena. The writer is Editor-in-Chief of India Writes www.indiawrites.org. 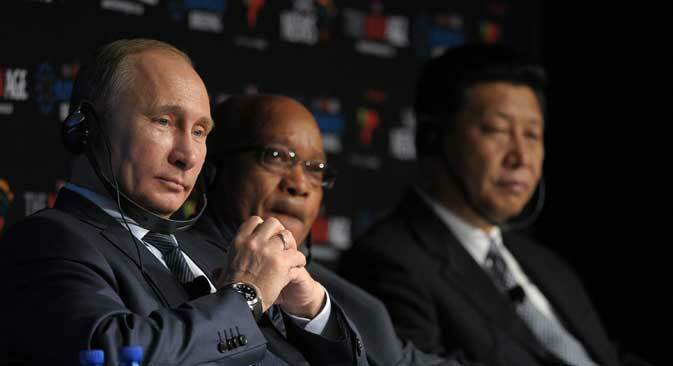 He is in Durban to report and analyse issues and outcomes of the 5th BRICS summit.